Query performance prediction (QPP) is a fundamental task in information retrieval, which concerns predicting the effectiveness of a ranking model for a given query in the absence of relevance information. 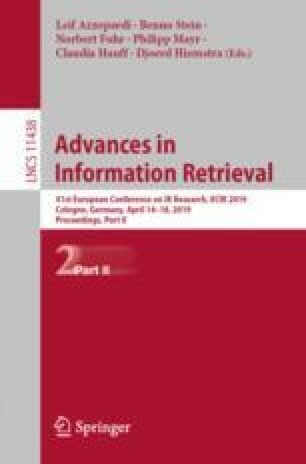 Despite being an active research area, this task has not yet been explored in the context of automatic text classification. In this paper, we study the task of predicting the effectiveness of a classifier for a given document, which we refer to as document performance prediction (DPP). Our experiments on several text classification datasets for both categorization and sentiment analysis attest the effectiveness and complementarity of several DPP inspired by related QPP approaches. Finally, we also explore the usefulness of DPP for improving the classification itself, by using them as additional features in a classification ensemble. Work partially funded by project MASWeb (FAPEMIG APQ-01400-14) and by the authors’ individual grants from CNPq and FAPEMIG.